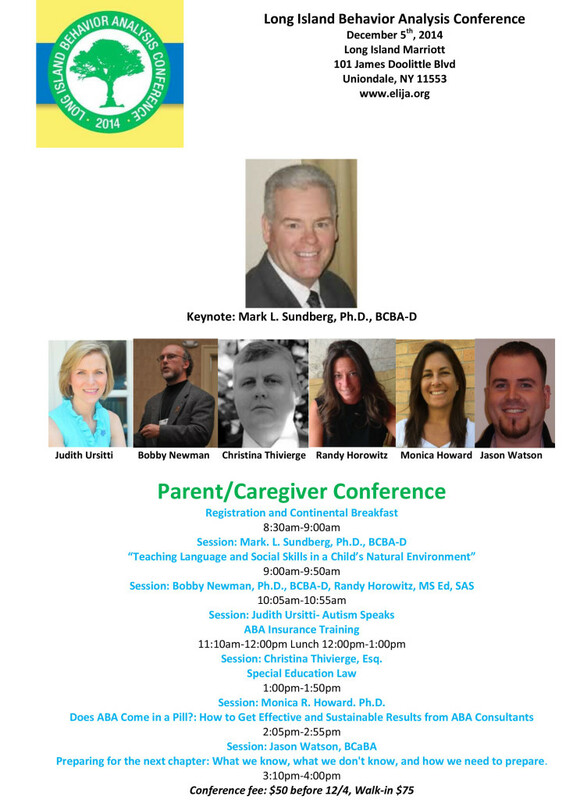 We are so excited to be a part of this upcoming Long Island Behavior Analysis Conference! The conference will be held at the Long Island Marriott in Uniondale, New York. Registration information can be found here. Come say hi! We will have a table at the conference, where we will be selling the VB-MAPP, Teaching Language to Children With Autism, ABA Curriculum for the Common Core: Kindergarten, and a number of our other favorite titles and products – all at discounted prices! This conference is geared towards ABA professionals, with Type 2 CEU’s available. There is also an alternative track for parents interested in attending. For more information, visit the ELIJA website here. Written by: Different Roads to Learning on November 19, 2014. This entry was posted in ABA, Academics, Applied Behavior Analysis, autism, autistic spectrum disorder, Behavior, Conferences and Events and tagged ABA, Applied Behavior Analysis, autism, Autism Conference, autism education, autistic spectrum disorder, behavior management, Bobby Newman PhD, developmental disabilities, ELIJA Foundation, LIBAC, Mark Sundberg, Patrick Friman, Resources, special education professional, teaching, workshops for parents by Different Roads to Learning. Bookmark the permalink.